If your 3 year old does not take a nap two days in a row, she will pass out on the way home from her brother’s baseball game at 4:30 in the afternoon. And she will not wake up for dinner. Or dessert. Or bedtime prayers. Or even when she is transferred to her bed at 9:30 that night. She will, though, be wide awake and very hungry at 3 am. Which will give her bleary-eyed mother plenty of time to empty pictures off her camera and type Oktoberfest recipes into the computer. I’m not sure the coffee will get me through the day. We had gorgeous weather on Saturday, so most people stayed outside on our big deck. I probably didn’t need to bother to clean the house. About 64 people came, which is among our smallest. We were competing with several locals festivals, but it couldn’t be helped due to Bill’s last class for his Master’s (he’s done! he’s done!…well, except for the comprehensive final…but, he’s done!). I generally make the same food every year. Yes, I did blog about liking variety, but this is my once-a-year party and I never make these dishes any other time. And having the same menu means that, by now (our 7th Oktoberfest), executing the party requires little to no thought, which means little to no stress. The Pumpkin Pie Cake was new this year (yum!) and although I usually make Apfelkuchen, the creamy version here was a different recipe (also, yum). Getting dressed up is half the fun . October in Georgia is still barefoot weather. My girlfriend brought Cucumber Salad (a recipe similar to this one). 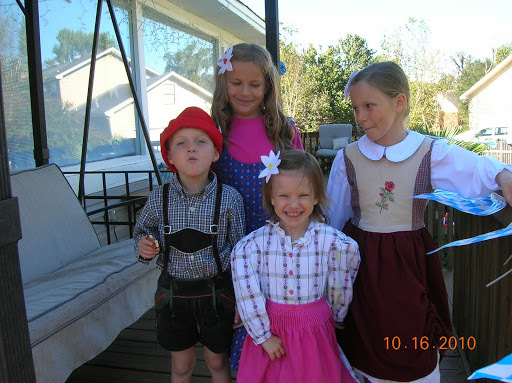 She also made Peter and her boys cute little Alpine hats and edelweiss flowers for the girls’ hair (see photos). I believe she got the directions from the latest issue of Faith and Family magazine, and she said they were very, very easy. If you were going to throw a party for 50 people (3:2 adult to kid ratio), I suggest one Sauerbraten and quadruple the potato salad (the recipe is for 3 potatoes, so 4x is about 4 pounds). If you had 100 people, double those, but do not double the red cabbage or you’ll have tons of leftovers. I usually do one brat per person and have leftovers which is totally fine by me. Hotdogs, I do one per kid plus another package. When my girls are older, I hope to make the rolls from scratch. For now, I buy hotdog buns. Of course, you have to have good mustard. This is my favorite, but I can’t get it locally (the commissary at Fort Belvoir had it in the deli section, but they don’t have it here). Instead, I had some of this and some of that. And that’s my Oktoberfest party. My original thought (way back when) was to get other families in my circle of friends to select a theme and host a yearly party. If 4 of us spread them out, we could have a quarterly bash. Woulda been, coulda been great. And then we moved. 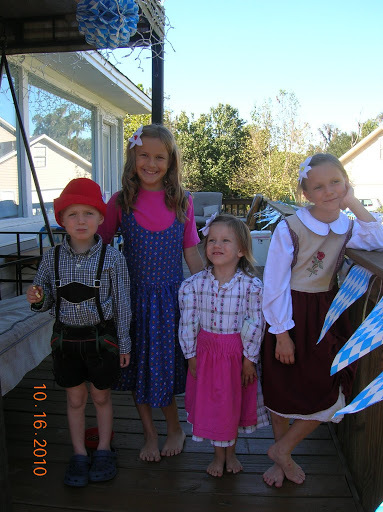 That first Oktoberfest (dear New Jersey friends) remains the best Oktoberfest we ever had. We miss you guys. I have baked one cake and a second is in the oven. The first of two sauerbraten roasts is simmering on the stovetop. 74 bratwurst are boiled and ready to be grilled to perfection tomorrow evening. One more cake, three batches of potato salad and a very messy red cabbage dish left to prepare. Maybe cookies. And errands. Need propane. Need CO2 (right? everybody needs some CO2 for an Oktoberfest). I ran out of cinnamon, so I’ve been using apple pie spice instead. Need cinnamon. Need whipped topping. Somebody needs to do a Latin test. Two somebodies need to finish up some history work (one essay needs to be typed and one short answer questions need to be revised). Somebody else needs coffee and a shower. Have a great weekend. I hope to get some recipes up by Monday. Want to taste the Pumpkin Pie Cake first to see how it is. It smells delightful.